It’s so disconcerting to see a Netflix logo at the head of an anime disc. It’s a sign. It’s a sign that we may have hit peak anime, and that the bubble is about to burst. Last time this happened was around 2008, back when anime companies were hoovering up licenses, the competition driving prices sky high, all to fulfil a fan fervour for home media that didn’t actually exist. The industry crashed, and crashed hard, taking out companies like Bandai, Geneon, and ADV in the process, although Sentai did rise out of the ashes. Sentai and Funimation dusted themselves off and started again, the intention no doubt being to grow the anime industry at a pace that suited the demands of fans, grow with the customers. Kei Nagai was pretty much a typical high school student. Okay, he was on the fast track to academic excellence, spurred on by his mother towards a career in medicine, but in every other respect he was a normal boy. Then he was hit by a truck and killed while crossing the road. And then he came back to life, with special powers and a bounty on his head that leaves him on the run with his childhood friend Kaito. Kei is an Ajin, an immortal being of a type first discovered 17 years previously. They appeared during a war in Africa, when the dead started to rise up. Now these Ajin are appearing around the world, and they’re quickly labelled public enemies, freaks with strange powers, and targets for governments to experiment upon and use. 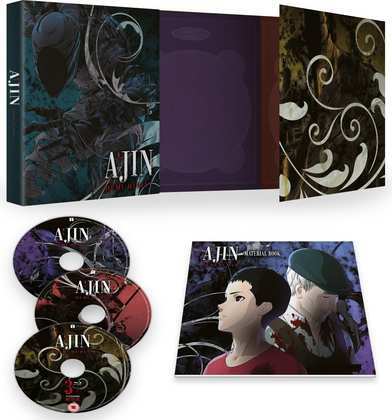 Thirteen episodes of Ajin: Demi-Human, Season 1 are presented across two Blu-rays. A third Blu-ray disc contains the first feature film spin-off, one of three that adapts the episodes into a movie format. For the purposes of this review, I watched the series only. 1. What’s That Stuff Have to Do With Us? Ajin gets a 1.78:1 widescreen transfer on these Blu-rays. The image is clear and sharp, the animation is smooth and CGI fluid, and there is no issue with compression, or aliasing, although digital banding does crop up from time to time. The elephant in the room is the cel shaded, 3D CGI look, which if you’re into traditional anime, can be a jarring transition, although if you’ve seen Knights of Sidonia, RWBY, or more recently Ronja the Robber’s Daughter, you’ll know what to expect from the aesthetic. These characters are good at moving, the animation makes action a comparative breeze, but when it comes to characters conveying emotion, you find that you’re relying on the voice actor more than the visuals. It looks adequate, and I do find long stretches where I can forget the animation and just go with the story, but then there comes an awkward close-up that doesn’t quite work, and I get thrown out again. The series discs offer DTS-HD MA 5.1 Surround English, Japanese and Spanish, with translated signs for the English and Spanish tracks, and the option of watching the Japanese audio with translated English or Spanish subtitles. These options are locked during playback. Note that the bonus movie disc offers DTS-HD MA 5.1 Surround Japanese with English subtitles only. 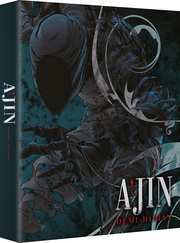 Ajin has some stonking audio, a fully immersive surround track that has some serious LFE to it. The volume levels are quite high, so you’ll find yourself nudging the volume down on more than one occasion, especially when guns are being fired, and explosions are bringing down buildings. The dialogue is clear, and the music drives the emotion of the piece well. The subtitles are timed accurately and are free of typos. The discs boot to static menus, and each episode is followed by a translated English credit reel. Disc 2 has the extras, which comprise the textless credits, a 9:16 Animatic Process Scenes reel which shows how the animation comes together, and trailers for School Live! Knights of Sidonia: Battle for Planet Nine, Is It Wrong to Try to Pick Up Girls in a Dungeon, and Chivalry of a Failed Knight. 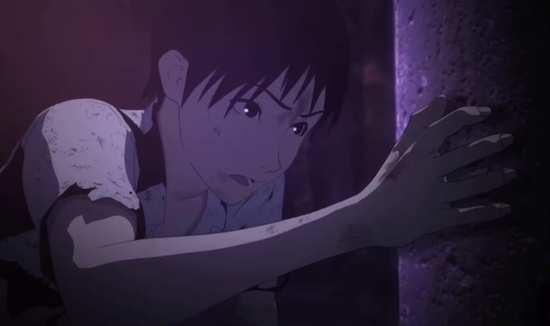 Disc 3, the Ajin: Demi-Human – Compel feature film lasts 106:53 and collects the first few episodes of the series, re-editing them into a feature. I haven’t watched it to see if there is any new footage, but for once I wasn’t compelled (pun intended) to re-watch a story that I had just seen. 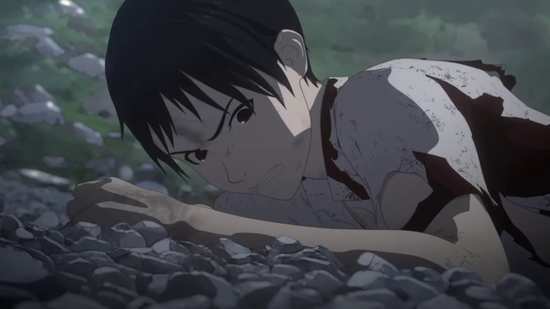 In the US, the second series of Ajin comes with the other two movies edited from the series, and I expect the same will happen if and when it is released in the UK. You also get the textless credits and teasers for the movie as well on this disc. I don’t like the look of this show. Knights of Sidonia just about got away with it due to its setting and its preponderance of mecha, but Ajin takes place in the ‘real’ world with no such esoteric visuals. And digital models just can’t convey the same level of emotion that traditional animation allows for, not at the budget or production values that Polygon are working with. You have to rely on the quality of the story, as well as the voice actor performances to sell what Ajin: Demi-Human is bringing to the table. Fortunately all of that is more than good enough to make this a must see, and indeed must own show. Ajin is one of the best action sci-fi supernatural mysteries I have seen in a long time, bringing shades of Tokyo Ghoul and of Death Note to the table, as well as doing its own thing. We get two introductions to the show, first an unrelated action sequence showing what Ajins are capable of (a bit like the immortals in Highlander), and then we meet the series protagonist Kei Nagai in school, where a lesson on Ajins is taking place. It’s there that we learn that there are less than fifty of them registered in the world, just two in Japan, and they are treated as less than human, as monsters to be feared and attacked, to be captured and ‘kept safe’ by the government (which in other words means to be used and experimented upon). Quite naturally, Kei’s life is turned upside down when he dies, and resurrects as an Ajin himself. And then we learn in more detail what Ajin can do, including paralysing others with their scream, and more importantly, generating IBMs (Invisible Black Matter), black ghosts, second selves that others cannot see, but which they can control, to attack, to defend, to spy and so on. 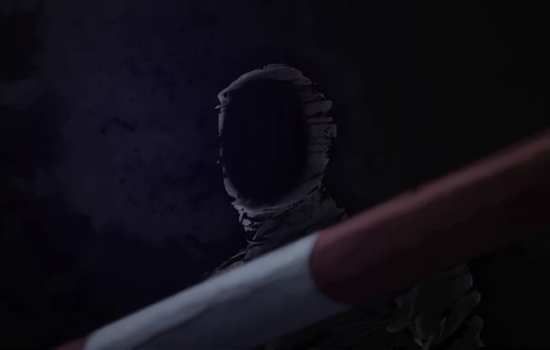 They’re a little like Ryuk in Death Note, the way they hover over the shoulder, but are completely black, humanoid forms that are extensions of the Ajin, although in Kei’s case, his black ghost behaves with a strange degree of independence. The first arc of the show follows Kei as he deals with his new status, with how everyone suddenly sees him as less than human, as an opportunity to profit, and given that he’s now immortal, others aren’t shy about inflicting pain or trying to kill him. After all, he’ll heal within a few seconds. Only his childhood friend Kaito is willing to help him, and they escape the Ajin hunters to look for refuge. But it becomes clear that this isn’t a situation that can continue. 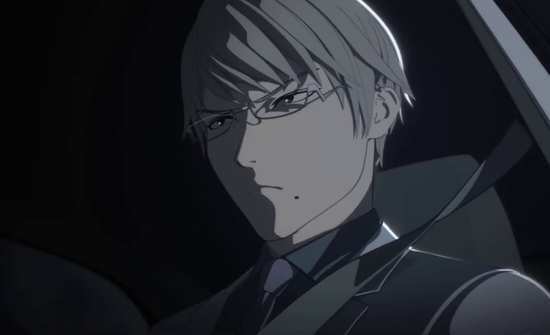 On the other hand, it also becomes clear that the officially registered Ajin are just the tip of the iceberg, and that there are several immortals living under the radar (including one among the authorities that is hunting Kei down). More important is the Ajin Sato, who has an agenda that opposes the official position on Ajin as subhuman. It’s an obvious allegory for the persecution of minorities, and the response that persecution engenders is predictably violent and criminal. Sato has nothing less than terrorism in mind, and he’s not above using extreme means to recruit others to his cause. He sees Kei as a potential recruit, but not without suitable indoctrination. 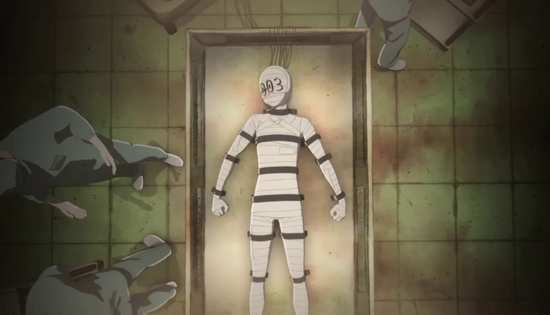 He arranges to meet him, but also arranges for him to be captured by the authorities to get an idea of what Ajin have to suffer, using his opponents to brainwash him. So when Sato breaks him out again, Kei should be pliant and a perfect soldier for the cause. And Sato has big things planned, which unfold as the series progresses. He’s quite the criminal mastermind, prone to quoting Hannibal Smith from the A-Team, and makes for a charismatic antagonist. 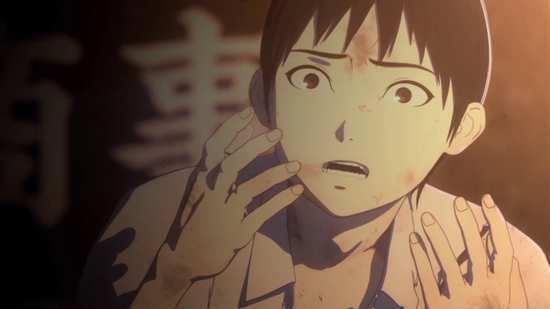 What makes Ajin so appealing is that Kei is far from the typical protagonist. Even before his death, he’s presented as a sociopath, wholly lacking for empathy, someone who only does the right thing because it benefits him, is expedient, or is expected. Halfway through the series, another Ajin named Ko is revealed, a boy who managed to escape Sato’s recruitment pitch, and who learns what Sato has planned. Determined to stop it, he looks for Kei for help, only to be confronted with someone who’s finally found a place of safety, a bit of anonymity, and who will do whatever he has to, to stay safe. It’s this anti-hero aspect to Kei that makes this show stand out, and so compelling to watch. 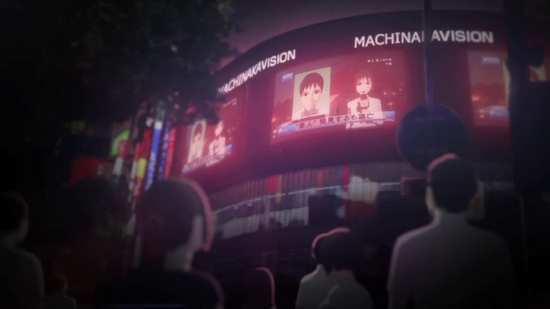 There is the third aspect to the show also, that of the authorities that hunt and try to profit from Ajin, and the politicking going on there. That’s personified by Tosaki, the head of the hunters, more of an investigator chasing after Kei, as well as expected to deal with Sato and his cohorts. His ace in the hole is his aide, Izumi, who herself is a clandestine Ajin. He has to deal with wheedling committee members, research scientists, and politicians bent on fighting some sort of Ajin arms race, and as a result he’s a man under constant pressure. But he has his own agenda as well. 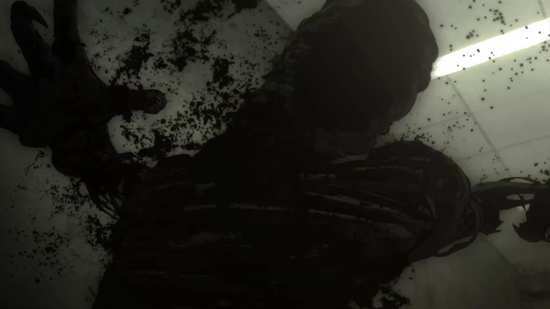 Ajin: Demi Human is never going to be pleasant to look at, but the story is top notch, the characters are interesting, and the writing for the show engenders the ‘one-episode-more’ addictiveness that is the Holy Grail for serialised storytelling. You can see why Netflix invested in this one. If you like Death Note, then you really do have to watch Ajin. I only hope that All the Anime can get season 2 out in short order.